I'm declaring today Lipstick Day to make up for yesterday's sold-out limited-edition Edward Bess one. I'm going to post shortly two lipstick reviews, one is a limited-edition that you can definitely get right now, and the other is a permanent. And as you see above, there are more lipstick reviews in our future, including a brand new Kjaer Weis. The book in the photo is another treat, and an incredibly cheap one, at that. 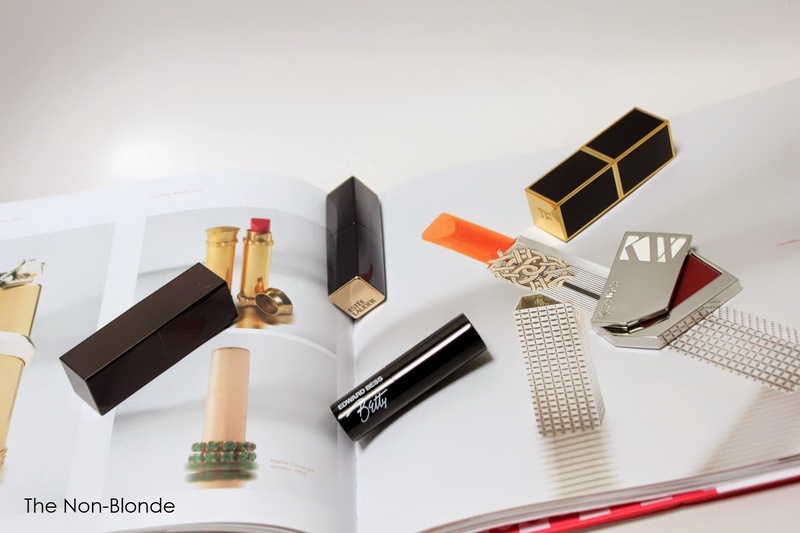 Lips of Luxury by Jean-Marie Martin-Hattemberg is a quick photographic journey through the history of modern luxury lipsticks. The pictures are so delicious they make up for the fluffy proze (written in both French and English). The book came out in 2009 and is technically out of print, but there are plenty of brand new copies on Amazon Marketplace for around $6 (even with the $4 shipping it's still cheaper than any lipstick I've bought in decades).